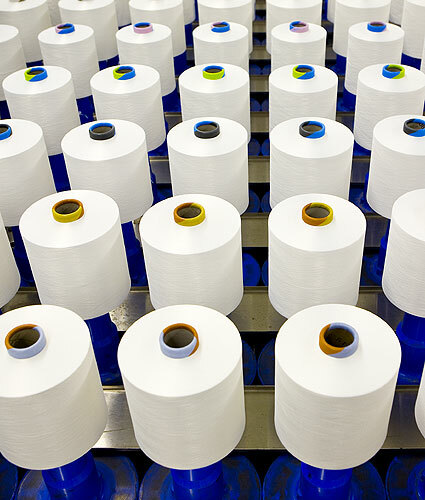 I recently had the opportunity to learn about how synthetic yarn manufacturer Unifi Manufacturing Inc. used Minitab to optimize its false-twist texturing process. Many of you probably have several connections to Unifi yarns that you just don’t know about! In fact, you've probably found yourself wearing clothing made with Unifi yarns, or sitting on a couch made of stain-resistant fabric that was upholstered with Unifi yarn technologies. What’s neat about Unifi products is that the company’s manufacturing processes turn raw and recycled materials and fibers into synthetic yarns that behave like natural yarns, but have superior performance characteristics. Unifi’s customers can specify the yarn characteristics they need—such as dyeability and strength—then Unifi produces the customized yarn by adjusting machine settings using a process known as false-twist texturing. With many yarn characteristics requested by just as many different customers, you can guess that the false-twist texturing process is very complex! The complexity of the process, and the number of highly-correlated, manipulated factors involved, made it difficult to perform data analysis for process optimization and quality assurance. Unifi quality technicians needed to find the type of analysis best suited for practical daily use. They used Minitab to evaluate and compare models from three different methods—multiple linear regression, principal components analysis, and partial least squares (PLS)—to find which would work best for optimizing the false-twist texturing process. 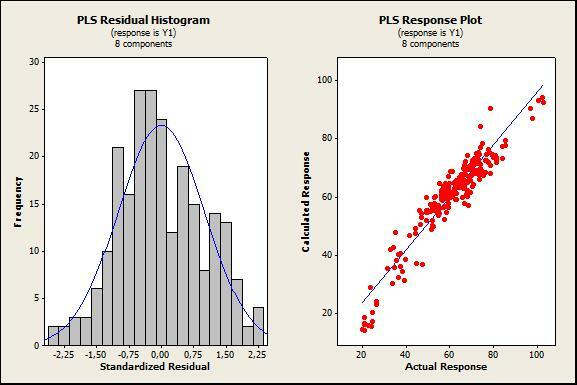 Minitab analysis of data collected at the Unifi spinning plant in Yadkinville, North Carolina, revealed that PLS analysis was the fastest and simplest method for generating accurate models, and was also the best of the three at remedying highly-correlated factors. The other approaches required additional experimental work, which was much more expensive and time-intensive—and thus not feasible for everyday use. With PLS, Unifi technicians also were able to identify outlier data sooner than they could when using classical linear regression. This saved time and allowed technicians to catch and fix potential problems with the process much earlier than they had been able to do before using PLS. This new approach also made it possible for technicians to quickly update new production data based upon process adjustments, and then view the changes visually with graphs. Seeing how variable settings changed yarn properties made it easy to achieve the quality characteristics their customers need. Because the yarn industry’s widespread use of process improvement techniques and statistical software is still relatively new, Unifi’s success demonstrates that these techniques can be applied more frequently and more extensively in the future! Click here to read the full case study on Minitab.com. How does your company use Minitab for data analysis?